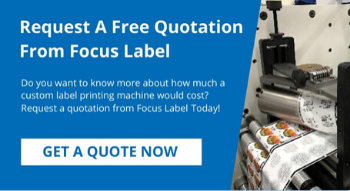 Part of the added value we offer our customers at Focus Labels is the ongoing support and technical assistance you receive after your equipment is installed. We want to make sure your equipment has a long and productive working life and that your team has all the support they need. We therefore employ a team of support engineers who work from our UK headquarters, as well as a network of Focus trained and approved technicians who can provide on the spot support in your local area. Whether you have a technical question or a minor issue that our remote support team can resolve, or if you need us to send an engineer to site for fast diagnosis and repair, we are always willing to help. We also provide full training as part of our manufacturing service. We ensure your team have all the knowledge and skills in place to operate your new equipment correctly and efficiently. You can find out more about our training service by clicking here. For an up-to-date product brochure, featuring all our latest equipment, simply send us your name, email address and specify which equipment you would like further information about through our contact form and we will send you a download link..
Are you looking to modify, expand or upgrade your label printing operation? Turn to Focus Labels for market leading standards in innovation, construction quality and technical assistance. For a bespoke quote, please let us know a bit about your requirements through our online contact form, and someone will be in touch as soon as possible. As part of our technical assistance we operate a working showroom featuring operational examples of all our print machines. You can request a demo at any time. Simply send us a message through the contact form on this page and one of our advisers will be in touch to arrange a convenient time. We look forward to welcoming you to our production workshop and facility.